We offer Title 24 Energy Calculations Reports for a fixed flat rate of just $245 for properties under 6000 square feet with a fast turnaround time click below to learn more or call 909-257-7547 one of our energy consultants today. In efforts to lower energy consumption in California, the California Building Commission created the Energy Efficiency Standards for Residential and Nonresidential Buildings in 1978. This is the Title 24, part 6, of the California Building Standards Code. These energy standards are applicable both to residential and nonresidential buildings inclusive of schools. 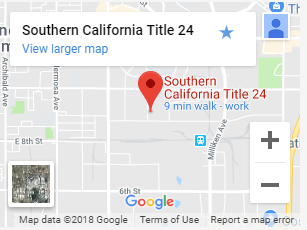 Title 24 is made up of twelve parts that are all broken down to specific guidelines and regulations governing new construction, additions, ADU’s and remodels of buildings in California. The goal is to ensure the achievement of energy efficiency and preservation of both indoor and outdoor environments and energy consumption. Public protection. The California Energy Code has in place security and safety precautions that shield all the parties; the engineers, the construction contractors, and the occupants of the buildings. They have created safe, well light energy effective environments. Efficient energy. Over time, California has managed to see to it that the energy being produced equals or exceeds the energy being consumed. This perfect balance not only results in efficient energy use, but it also enables its people to have access to adequate energy that is reasonably priced but most importantly environmentally friendly. Comfort for residents. California strives to constantly and consistently reduce greenhouse gas emissions into the environment. This not only keeps the air clean and healthy for the people, but it also prevents the growth of potential environmental hazards. Reduction and eventual elimination of waste. Through upgrades and constant revision of the energy code, California strives to reduce wasted energy. Motion sensors and manual on/off occupancy sensors significantly reduce the amount of wasted electricity. These changes to the energy code have helped to reduce the amount of wasted energy. Previously, only state-owned buildings were expected to comply with Title 24 rules and codes; not anymore. Now, all buildings should comply with the same regardless of whether they are residential or nonresidential, whether they are new buildings or old ones. Title 24 is broad and has requirements touching on the envelope (insulations), mechanical, electrical, water heater and windows of a building. Title 24 has spilled over to the lighting and lighting controls of buildings. Through inspections, the inspectors will ensure that your building meets all the requirements pertaining to lighting; manual for both the interior and exterior lighting controls and lights, insulation values, and energy efficiency of windows. Ultimately, Title 24 seeks to ensure all buildings are energy efficient. When do you need a Title 24 Report? There are some conditions that you will identify before being in the position to get a Title 24 report. The main condition is that your home is located within the state of California. Whether it’s a new construction, addition ADU or remodel below are some scenarios in which a Title 24 report is required. When building a new home, office, school, or multi-family. You will be required to submit your Title 24 report and compliance before you are issued the building permits. When constructing an addition to an existing home, office, school, or multi-family. If your additional space includes new walls, windows, water heater, alterations to your HVAC you will need to submit a title 24 report. A CF1-R compliance report will be required before you are issued the construction permits. If your remodel appears to in one way or another affect the windows, exterior walls, or HVAC, you will definitely be required to have a Title 24 report before you get a permit. 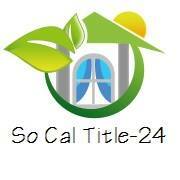 SoCalTitle24.com offers solutions pertaining to residential Title 24 Reports to building designers, owners, and contractors. Residential Title 24 reports will cost $245 for all projects less than 6,000 square feet and the turnaround time is approximately three to five working days. Projects above 6,000 square feet will cost $345. We also offer same day rush service for an addition $95. We guarantee approval by your local building department. All reports include the registration fee with the State of California (if needed). All the corrections are covered in the cost of the report assuming there are were no changes to the building design. SoCalTitle24.com uses the latest Title 24 Calculations software hence you are assured of an accurate report meeting all the energy code requirements. Title 24 services are prepared base on the building plan provided by our client. We will carefully review all the plans and schedules to provide an accurate report for new construction, room additions, ADU’s and remodels. Our Title 24 calculations report covers envelope, lighting, windows, doors, and mechanical. Every building is different and your report will be customized for your project. Any design flaws of projects that are not in compliance, our staff will recommend solution to make your project Title 24 complaint.